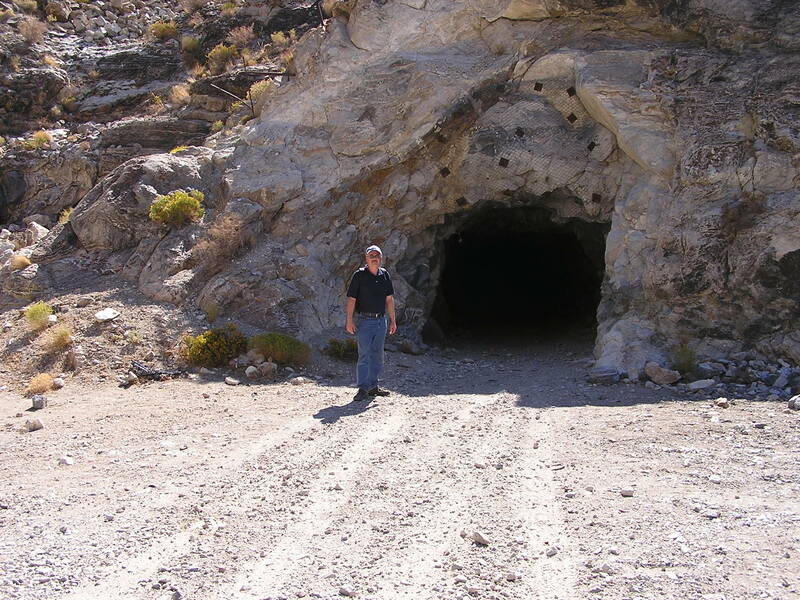 I had searched for this mythical cave for several years, as I wandered around the ruins of the mining camp of Reward at the foot of the Inyo Mountains (see my blog: “Finding Solitude at a Miner’s Cabin). All dead ends. At the end of the Manzanar-Reward Road going east from Highway 395, the foundations for the mill that processed the silver-gold ore fill the right or south side of the road. My previous blog guides you around the ruins of the rock walled miners’ cabins on the west side of the camp. However, where was the mine tunnel that was supposed to be big enough for a truck to drive into? Not a clue. Then one day, as I sat on a rock drinking Gatorade near the ruins of the old mill, a beat up, battered silver Toyota truck barreled toward me in a swirling cloud of dust. Two young men waved to me as they turned on to the rough, rocky road climbing past the miners’ cabins and curved around to the north side of the mountain. Here is a clue. Where are those guys going? I began to hike up that dirt road. You need good hiking boots here with high tops to support your ankles. The road curves up toward the ravine on the north side, straightens out and ahead of me I can see a huge mine dump. All of that rock and dirt tells me a big mine tunnel has to be up there somewhere. It is a slow, tedious walk. No matter how much I work out on the treadmill at LA Fitness to get ready for this landscape, the 4000+ altitude makes my legs rubbery for a couple of days. We are climbing now. I see pockets of “rat hole” mine shafts poking out of the side of the mountain. Miners worked this mountain creating a honeycomb of tunnels going back to the 1860s. Wise desert guides always warn us: “Never go into a mine tunnel.” But maybe this is different. As I come close to the mine dump, another cloud of dust announces the return of the beat up truck. The youthful explorers barrel down the very rough road toward me. As I approach the entrance, I remember that the last time this area was mined was 1981. Skip loaders worked this part of the mine recently. I could see some of the drill holes where they placed dynamite in a semi circle pattern to blast into the mountain. Bright yellow and red spray paint marked recent visits of a geologist recording the current flow of the vein of ore. I walk into the wide mine tunnel. It is solid rock, no supports. Looks stable. Some warnings: always enter a tunnel/cave staying to one side, in case some critter who is in there wants to make a fast escape. Also, throw in some rocks to test for snakes in the shadows. Depending on how far you want to go in, bring two flashlights and extra batteries. Wear a hard hat. You can also get a headlamp at the True Value Hardware Store in Lone Pine. As I hesitantly enter for the first time, I am nervous and cautious, as I am alone. Always best to be walking with someone else. As I walk, sunlight shimmers over the vein of ore imbedded in the native rock. The ground slopes downhill. A turn in the tunnel leads me into darkness. Turn on the flashlight. As I walk deeper into the tunnel, the sound of blood flowing into my ears beats like a drum. The slightest sound is magnified. I try something. I turn off the flashlight. Total darkness. I cannot see my hand in front of me. Silence. Darkness. I turn the light back on and walk a little further. On my right, a recess marks where some ore was dug out and an old wooden ladder hangs down, leading to an upper level of drifts in this honeycombed mountain. I was always taught that those ladders are rotten. Never climb them. But it gives us clues about the work. I walk 2,000 feet to the end of the tunnel where there is a wide turn around. Cold wind grabs me, coming from somewhere: another tunnel maybe from the other side. I turn to walk back, but hesitate because I want to experience this darkness and silence. I cannot tell you that I was at this point having an experience of the close presence of God. I felt anxious and apprehensive, and I sure wanted God close to me. The darkness fascinated me. Miles of tunnels emanate from this location. A rock falls. Sound echoes. If I were in another state of mind, neck hairs would bristle and goose bumps cover my body. What is down there in the lower levels of darkness? 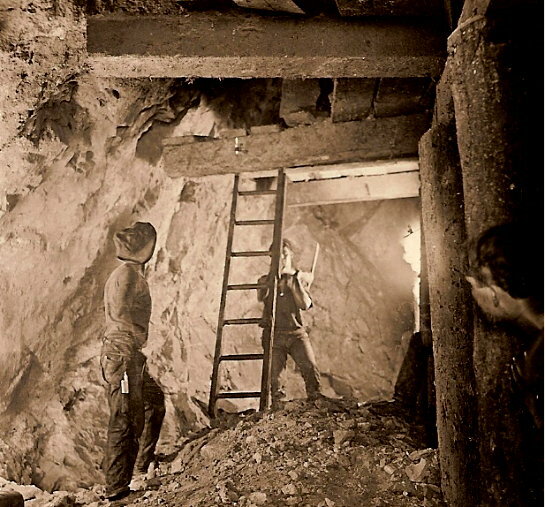 Ghost hunters could use sensors to test for spirits of miners who died violent deaths. Tommyknockers, the legendary gremlins of the mines, could be up to mischief. These thoughts occur to me as I am now writing, but I am grateful I did not think of these things during my visit. As I walked uphill toward the sunlight, I felt more secure. I slowly rubbed my hands over the rock walls, the variants of color. Quartz crystals thrust outward. I thought about the desert mystics who entered caves like this tunnel. Some were seeking rufuge from trouble. Others sought solitude to meditate on God’s presence. The prophet Abraham had two sons. His first son Ishmael by wife Hagar was displaced by the younger son Isaac born of wife Sarah. “As for Ishmael, I have heeded you. I hereby bless him. I will make him fertile and exceedingly numerous. He shall be the father of twelve chieftains, and I will make of him a great nation. But my covenant I will maintain with Isaac.” Genesis 17:20-21. Abraham took Ishmael and Hagar to the desert valley of Becca (Mecca) to spare them Sarah’s jealousy. The Quran says that Abraham and Ishmael built the Kabah as a shrine, where Adam first worshipped God. God told Abraham, according to the Quran, that the Kabah should be a place of pilgrimage. The searing desert heat drove Mohammed into the cool recesses of a cave outside Mecca. Mohammed frequently visited this retreat for silence and solitude, meditating and praying to Allah (which means “the God”, the same God as worshipped by Christians and Jews.). Mohammed withdrew from the noise and crowds of the city. Mecca had become a wealthy trading desert city as a pilgrimage site for many animistic devotees. The Kabah, an ancient meteor, was the locus of these devotions. Images of 360 different fertility gods surrounded this ancient spiritual space, a new god for each day as constant streams of pilgrims arrived. The city had become wealthy, but indifferent to the poor, who scrounged a living from the garbage dumps of the rich. This depressed Mohammed and made the retreats to the cave all the more necessary to find solace and peace. Mohammed was the last of a continuing chain of prophet who have come to restore the true religion. Islam is not a new religion. It is the restoration of the original monotheism revealed to Adam, Noah, Abraham and all the earlier prophets. At the age of 25, he married Khadijah, a rich widow who was 15 years older. When he was 40 years old, in the month of Ramadan, 610 CE, he received this call from God through the angel Gabriel in the cave of Hira. After this experience in the cave of Hira, he returned home deeply shaken. But Khadijah encouraged him to continue to listen to the voice of God. For 23 years, these revelations continued with the same theme: the one, true God was calling his people to Islam (trusting surrender to God). The tradition is that Mohammed could not read or write, so his followers had to grab whatever they could write on when Mohammed had these unexpected visits from the angel communicating the Divine Word. What the angel was communicating was the original Word of God from the Kitab, the Eternal Word in heaven. Jews and Christians received this same word, but they perverted it by their divisions. Christians deviated from this Word, teaching that God had a son who died on the cross for sins. Once again, Allah was giving this True Word, guidance for the Straight Path. Mohammed shared these revelations with his wife and family and then began to preach publically. His words threatened the economy of Mecca, as he condemned the idolatry of the 360 fertility gods. However, pilgrims from Medina, 250 miles to the north, who came to Mecca, heard his words and invited him to come to their city to solve their political and social problems. He and his followers left secretly. But in a scene, reminding us of when Pharaoh chased after Moses and his people in the Exodus, Mohammed and is old friend Abu Bakr hide in the cave and were protected by God in a miracle. An acacia tree had sprung up in front of the cave. A dove flew over, wove its nest and laid eggs. A spider spreads its web over the cave’s entrance to hide Muhammad from his enemies. Here is a YouTube video of a visit to the Cave of Hira. This Hijrah migration took place in 622 CE, the beginning of the Muslim calendar. In my world religion class, I contrast the devotion Jews and Christians have to their scriptures with the devotion Muslims have for the Quran. Jews and Christians have their books through many translations: Hebrew to Greek to Latin to various languages. There are no original texts. However, Muslims believe that the Quran they hold in their hands, written in the classic Kufic Arabic script, is the very word of God as originally given to Mohammed. They have direct access to God in their meditation and study of the Quran. A translation is not a Quran. For Muslims, the Quran is a sacred object. It should not be held below the belt and only on top of other books. Traditionally Muslims read the Quran by sitting on the floor, suspending the Quran on a kursi or chair. Before reading or meditating with the Quran, one must approach after ritual purification. Very traditional Muslims will teach that non-Muslims should not touch the Quran. I have a copy of the Quran given to me about twenty years ago by the Muslim Students Association of the college. It reminds me of the Oxford Annotated Study Bible. Each page has the traditional words in Arabic on the left side with an English translation to the right. Below are authorized commentary by a respected imam. As you read the Quran, if you are Christian or Jewish, you see old spiritual friends here: Adam, Noah, and Abraham. Each book is a Surah. There is even a Surah of Mary, which describes a very different birth narrative of Jesus. Jesus has a significant presence in the Quran. He is a Messiah, an anointed messenger of God. His presence is more that of a remote ascetic, but he is deeply revered. Muslims believe that on the Day of Judgment, Jesus and Mary will appear by the Seat of Allah. Muslim Sufi, Christian and Jewish mystics, find common ground in meditations on the presence of God as an invitation to loving friendship with the Holy One. If I read passages from any of these mystic poets, without knowing the specific religious tradition, I would say they have all encountered the same loving, compassionate Presence. “All the talents of God are within you. Like the scent of a lover’s body. “The Gift: Poems by Hafiz the Great Sufi Master”, translations by Daniel Ladinsky, p. 207. “The Meaning of the Holy Quran”, Abdullah Yusuf Ali. New Edition with Revised Translation and Commentary. Thank you for another magnificent post. The place else may just anybody get that type of info in such a perfect method of writing?